Home &sol; Social Media Hub &sol; How to Use Pinterest for Business Marketing? 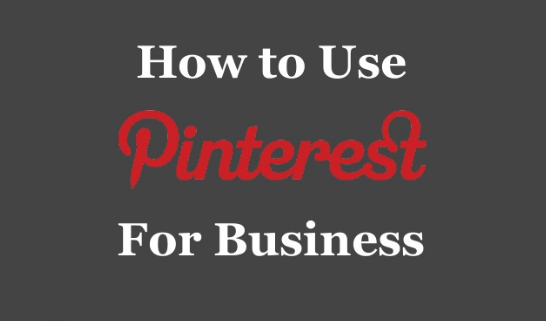 June 29, 2016 August 25, 2017 hubtechinfoLeave a Comment on How to Use Pinterest for Business Marketing? Being the famous social bookmarking platform, which takes an image-based approach to share information, Pinterest has emerged as an astonishing tool for business marketing and today we are going to discuss about how to use Pinterest for business marketing. The concept of Pinterest for business marketing has emerged as one of the best online marketing strategies. In order to get traffic from Pinterest to your blog or website, you need to make sure that the basic concept is learned in a detailed manner. Initially Pinterest did not encouraged business much but recently with the launch of ‘DIY Promoted Pins”, it has clearly declared its positive status for big & small businesses. But being on Pinterest and just exhibiting your brand on Pinterest is not the answer to increase your sales conversion rate on social networking sites! Pinterest has 100 million active users and more are pouring in at the speed of lightening. What does it mean to you as a marketer? It means that you have a potential prospect base of 100 million users to tap on. Do not even think once that Pinterest is an e-commerce site. No! Pinterest is just a visual podium, where users exchange ideas, inspire thoughts and boost creativity. But the potential attributes possessed by Pinterest makes it an ideal stage to be used for customer engagement at a mega level. In this blog, I will take my users one by one through various tips on how to utilize this sturdy platform for business marketing. As a business professional, the only thing that matter to you must be increasing the profit of the company, which is not wrong by all means. Generally, most of the brands keep on focusing how to influence their users and keep on pinning the images of their product line. What you as a smart marketing personnel should think of is what actually inspires you? Like many companies do pin but what they pin is mostly not product related. Creating pins to display what inspire your firm to be a brand; can increase the brand visibility & reach. Pinterest business account is an example of how Pinterest is literally creating a fence between its users to offer them services accordingly. Pins that are relating your brand with different ideas show how big and cool is your brand. Displaying the product is important, but engaging customers on their interest is the key to success on Pinterest. Creating a visibility among so many competitors is not an easy task. Brands keep on directing their striven efforts to accomplish their objectives of maximising the profit by reaching a large chunk of customers. But not all brands become successful on Pinterest; some flourish & grow, some vanish. What goes wrong with these brands? Well to start with, business professionals just pin the images and leave it waiting for a magic that can bring thousands of user to their website. Well, there is no magic ring that brings those users, but yes there are some tactical ways, using which you can reach on top of Pinterest marketing. Pins; something (image) which is being posted by you on Pinterest is termed as pins. 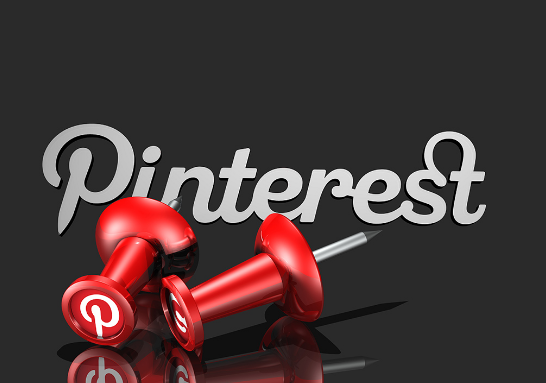 These pins can be optimized suitably to ensure a better performing Pinterest profile. To make sure that your pin is searchable, you should incorporate relevant keywords in the pin description. Raising sophistication of users has made them more demanding; hence marketers should focus on creating relevant content for customers. Wise marketing managers think like consumers and pin what they think would engage users more effectively. Understanding what appeals most to your target audience can provide you an advantage while planning ‘how to engage your customers’. Re-pinning the images that are trending among your audience can bring both your brand and customers on the same platform to communicate. Companies should not rely on pinning other’s pins only, rather they should pin their original content too. Posting original content leads on to tell your customers about your brand’s vision, product line and other information. This draws more prospects to your website, increasing your site traffics and ultimately leading to more purchase. While taking a visit through Pinterest, you can notice that the top brands are constantly using the quotes wisely. The kind of impact, which the above pin made, is impeccable. Brands should be tactical enough to understand the consumer behaviour effectively and engage them with more influential pins. Keep note that images with quotes in caption and no text overlays on it, performs worst, while images which shows quote in the image or there is a text overlay perform in the best possible manner. Some brand manager will be in dilemma that their target audience is in a time-zone, which is not in proximity with theirs. So, how to tap that chunk of customers? To solve this issue many third party services have came up with different features which enables the businesses to schedule the pins as per their preferences. Marketers can choose specific date & time on which they want their pins to be posted. Board is a collection of pins which are related to a definite category. You can create boards on various topics as per your interest or as per the interest of your audience. The main benefit, which brands can make from boards, is that it provides a clean and relevant podium to share with your audience. What I meant by relevant platform is that you can find out what interests your audience and choose the same to make a board. Apart from that, making discussion boards can also influence your brand, as it attracts many users if the topic is relevant to them. So, tell your marketing manager to choose a trending & relevant topic for discussion in conformation with your product line. Start a discussion board using the same topic and just see how many user turns up; I am quite sure you will be happy to see the results. Special attention should be paid while writing description for your board. Adding sensible keywords and writing relevant content for the board can draw users to your brand. To engage with a target audience, it is quite important for them to find and identify your brand. For the same purpose, SEO strategies are implemented by the marketing professionals. As a business owner, always keep in mind that SEO strategy is quite necessary for pulling more customers to your website. Writing specific keywords on the pin & boards description can increase your brand visibility. Website verification is another important aspect, which may sound new but yes it increases the SEO ranks of your website. Pinterest always shows top 10 boards on your Pinterest dashboards. This is termed as ‘above the fold’ content. Keeping your best boards above the fold can lead to exposure of your best content to the users, which will lead to increase in website traffic. Incorporating hash tags to a pin may increase the chance that more customers will find your pin. Ideally it is considered apt to include 3 hash tags on your pins. Including price on pins increases the likeability of your pin to get more likes. High user engagement is directly proportional to how easy you make it for them to decide whether to purchase or not. Rich pins are available for the same reason. 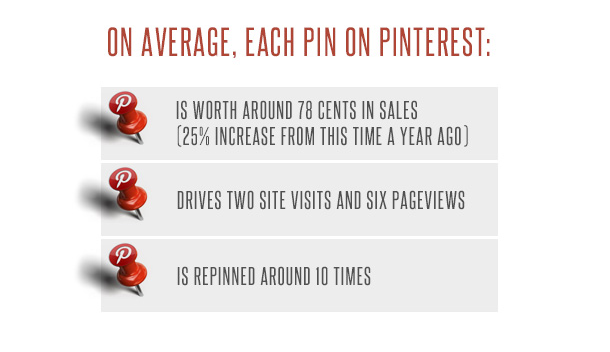 Brands use rich pins to reach more clients on Pinterest. Pinterest really likes the images that are longer in dimension. Choosing the width of image as 735 pixels or making the image with 2:3 or 4:5 aspect ratios (i.e. 1102 pixel tall) can bring more users to your pins. As a marketing manager, you should understand that making the images visually appealing is quite justified as it draws much attention of users than the content part. Although, content is quite important, but for smart managers, knowing the optimizing dimensions of image is equally important as well. Pinterest has updated and re-launched its sales button recently this year. Integration of save button to your website can draw all the traffic from your Pinterest profile to your website. Marketers should definitely know how to get started with Pinterest save button. Users can save stuff from any website by using 2 clicks through this Pinterest save button. The main use of Pinterest Save button is enable users to save any image they like so that they can refer it later for purchase decision. Suppose you are an interior designer and planning to decorate your boss’s office in an appealing way. You search different home décor images on Pinterest. After scrolling through several images, you finalize the top 50 designs. Using Pinterest save button, you can save those images and consult your boss showing them the final 50 list. Tracking the performance of marketing activity is one of the most important aspects in achieving high ROI (return on investment). Pinterest Analytics provides you the same platform, where you can find the Knicks & knacks of your Pinterest profile. 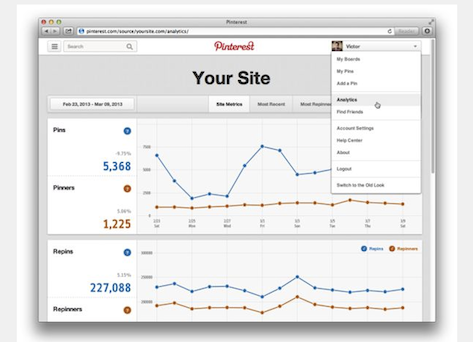 As a brand owner, you should be aware of how to use Pinterest analytics for business. Pinterest analytics render you the answer for a number of questions that boggle you while promoting your products on Pinterest; questions such as how to track the pins, boards, likes and repins? What kind of audience are you looking forward to? You have been promoting your product line on Pinterest but could not get the conversion as expected? All these questions that play with the mind of a marketing professional are answered by Pinterest analytics as a whole. You can simply find your worst & best performing pins that will give you an idea to repin the most likable ones and ignore or delete the dead ones. ‘To be or not to be’ a wise brand depends totally on the people driving it. If the professionals are wise enough to understand the relevance of this alluring visual website, they will surely make the brand fly high in the success sky. Pinterest can surely be many things but one thing which it cannot be is a platform which brands and marketers can avoid! You can simply close your eyes now, saying Pinterest is not necessary but somehow when you will open your eyes there will be no one left except you! So buckle up, tighten your marketing seat and take a flight to this amazing visual destination, where every brand is busy flaunting their products and each user has millions of brands to choose from. All the best!